ferrari r definately recovered from the aus gp..
Can Ferrari hold on to their performance at Malaysia? Can Massa finally get a good result? What role is BMW Sauber going to play? we may be in for some surprises....a front row starting position? Who crash into the barriers again? I think he'll finally wake up and help the team out with a podium showing in some way. Definitely a threat and very close to the top. My guess is on Sutil. I'd bet on them because they tested here and any slight advantage matters. Maybe he can get a 2nd place, I don't see him as a winner. But one thing that I'm sure of is that he'll go for the pole with less fuel than Kimi. Get ahead of one McLaren at least, like last year. In the desert you can hardly see rain. But I want rain very soon on any track except for Monaco. David Coulthard maybe, hard to tell. Although I like the tracks outside Europe a lot, I can't wait for the European races. Too bad that Imola is out of the calendar this year again. The last 2 races there were really good. I hpoe they will have the second fastest car on Sakhir. Well, Massa, or Filipe, may be Massa - will somebody finally bring back TC? Sato will hit the barriers. Not as good finishing as the first 2 races. 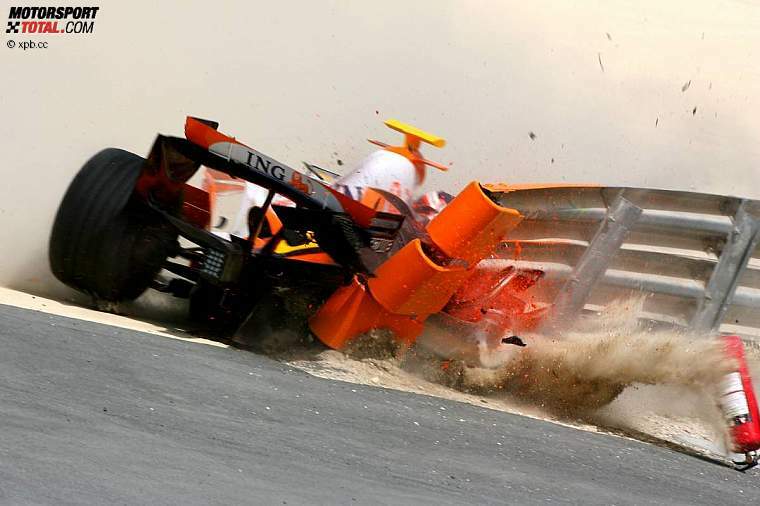 Łukasz wrote: Who crash into the barriers again? Didn't keep Heikki from having a big shunt into them last year in testing.